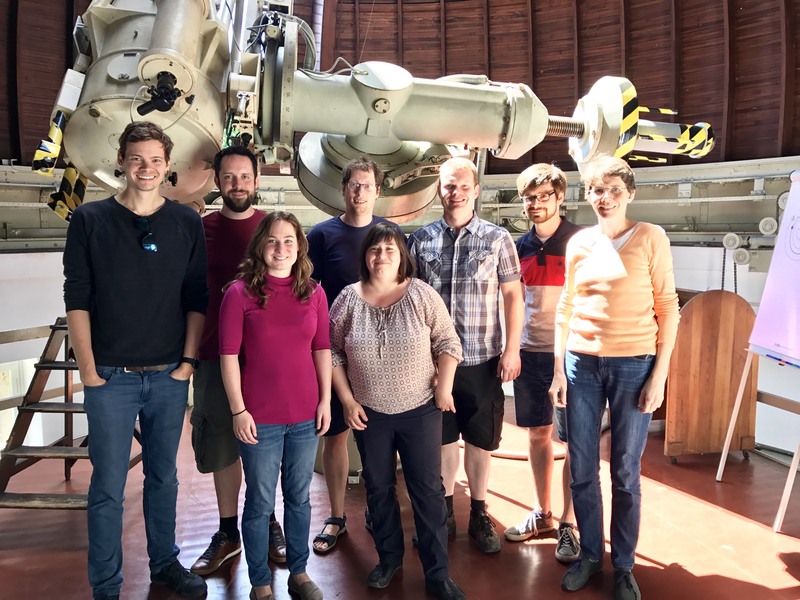 The CARS team published the first results from the SOFIA FIFI-LS instrument of spatially-resolved [CII] 158micron emission in a nearby luminous AGN host galaxy at redshift z~0.04. 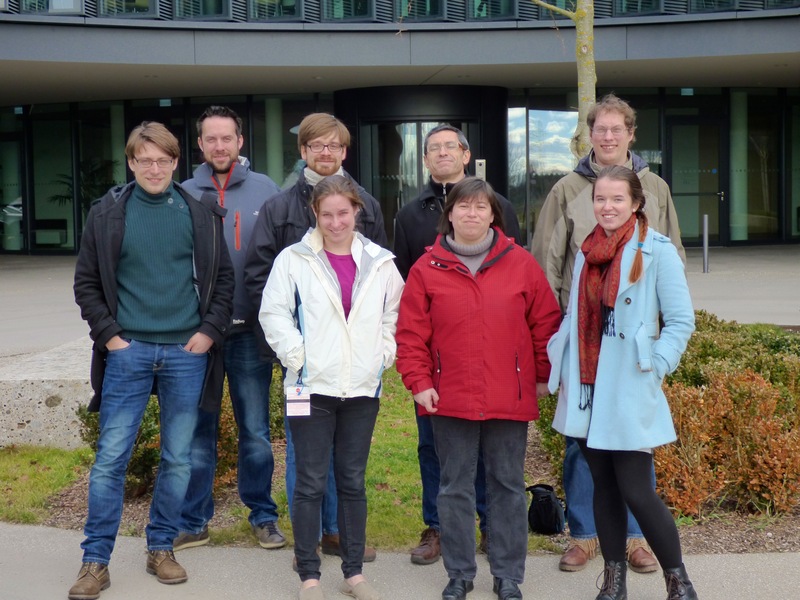 The work is led by Dr. G. Busch from the University of Cologne and shows that the [CII] emission largely follows the expectations from the amount and distribution of ongoing star formation in the host galaxy as mapped with the VLT-MUSE integral-field spectrograph at high spatial resolution in the optical. It shows that AGN do not necessarily impact the [CII] excitation, but a larger sample is currently under investigation to confirm this result. The SOFIA FIFI-LS instrument also detected [CII] emission far beyond the host galaxy which has an unknown origin. We speculated that neutral gas in the outskirts of the disc is excited either by the UV background or a diffuse radiation field from the galaxy itself. In summary, the CARS team has successfully shown that the SOFIA airborne observatory is able to capture [CII] emission not only in our Milky Way but also in nearby galaxies out to significant redshifts. The article will appear in the upcoming SOFIA focus issue of the Astrophysical Journal Letters. Comparison of the predicted [CII] map from Ha observed with VLT-MUSE and the real [CII] map observed with SOFIA FIFI-LS. The elongated [CII] structure of the prominent star forming bar in this galaxy is well visible even at the limited spatial resolution of SOFIA. The [CII] surface brightness follows nicely previous relations established for star forming galaxies observed with Herschel. This shows that the prediced outflows are not necessarily ubiquitos in AGN host galaxies. Either the multi-phase gas composition is different than predicited, the AGN is too young to show outflows on large scales, or the AGN is actually not capable of diriving a powerful outflow. Of course, with two objects we cannot systematically explore these effects, but these X-ray observations needed are expensive were done here as a pilot study. We expect that the CARS team is going to obtain additional Chandra observations in the future. 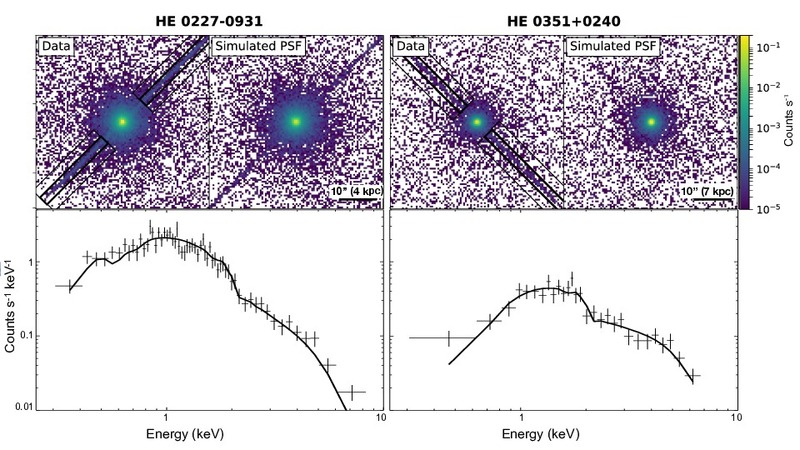 Chandra X-ray images of HE0227-0913 and HE0351+0240 together with their matched simulated PSFs. Below is the X-ray spectrum extracted from the read-out strike that is modelled with a single power-law model. 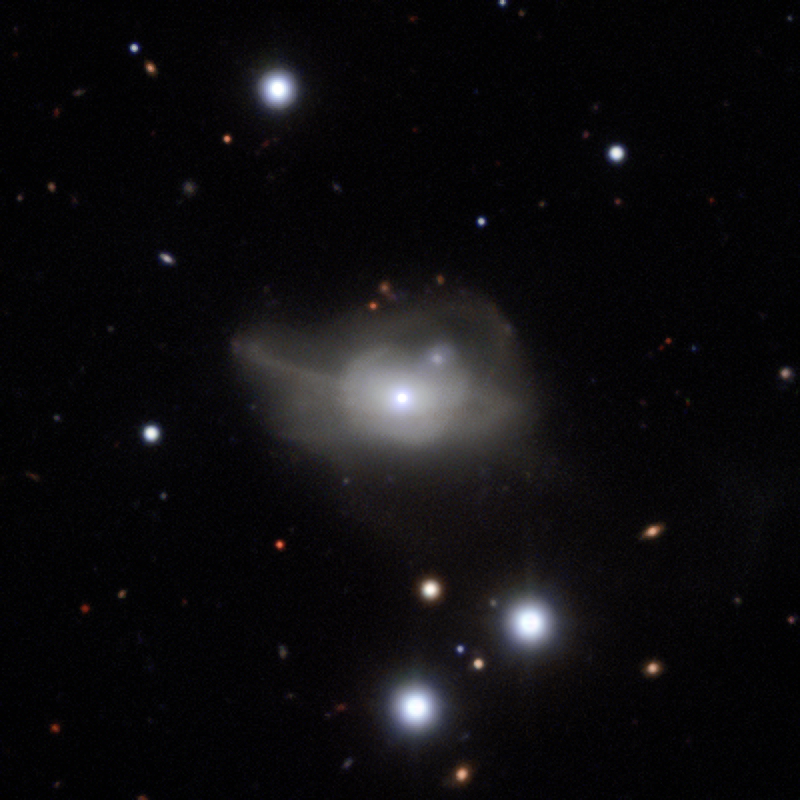 Our team continued to monitor the changing-look AGN Mrk1018 after its rapid decline. Our new paper led by Mirko Krumpe nicely shows that the dimming of Mrk1018 surprisingly halted by now and has likely reached a minimum in activity. This already rules out some scenarios like a tidal-disruption event. It opens the possibility that Mrk1018 is turning bright again at some point. Our multi-wavelength monitoring of Mrk1018 is therefore continuing and we are expected to present exciting results on this enigmatic AGN in the next years. U-band light curve of Mrk1018 after deblending the AGN and host galaxy light using galfit. 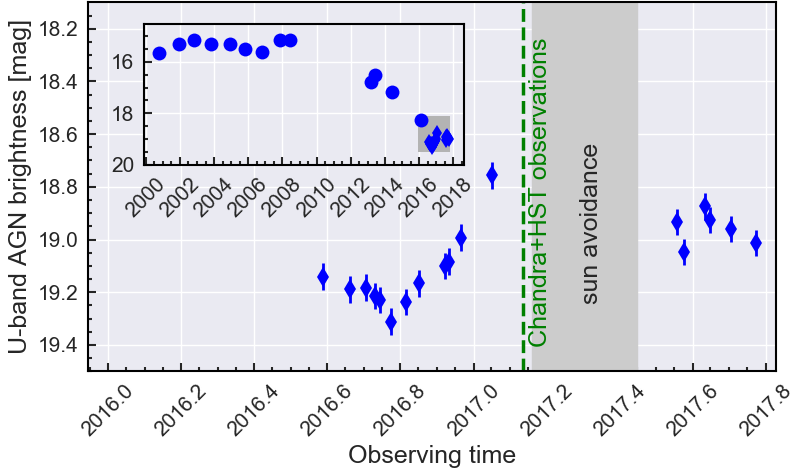 The strong decline of the changling-look AGN has clearly stopped and shows variabiliy on yearly timescales.